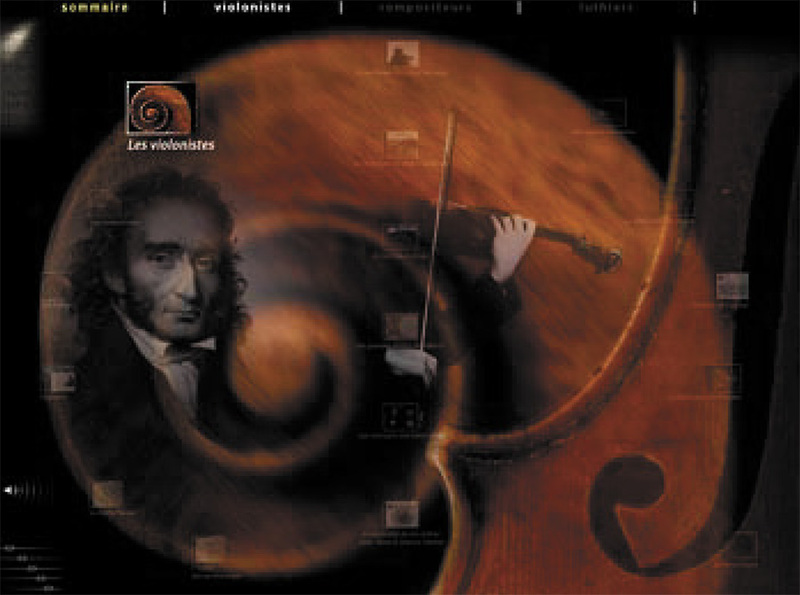 The Violin was the third CD Rom project I worked on at Magic Media, a Belgian new media studio composed of producers, designers and software engineers devoted to the development of high quality interactive content since 1994. 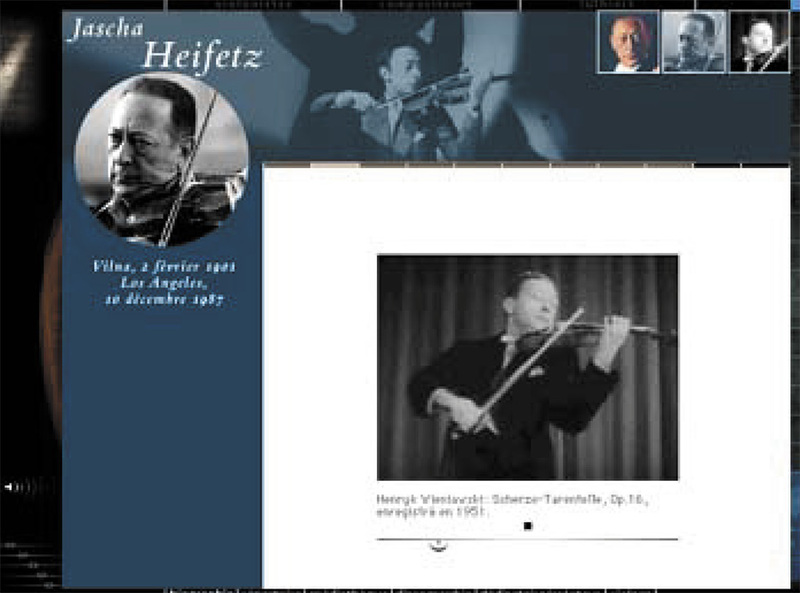 It quickly became the multimedia reference title on the world of the classical violin, describing violinists, composers and violin makers from the very beginning of the instrument. Thanks to its unique database, a library with thousands of items of information searchable with multi-criteria references it proved a bestseller in France since its release. The interactive design and functionalities were state-of-the-art with a creative, intuitive and efficient user interface allowing either exploratory browsing, through a network of more than 5000 hyperlinks, or fast searching, through a media library of more than 1000 artists described. 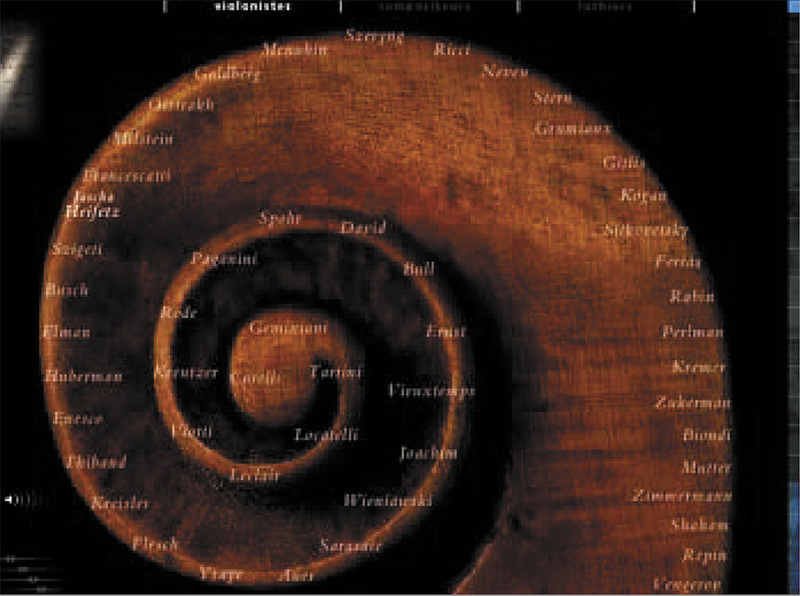 The CD-ROM also contained an astounding 3D chronology interface. Whether you were an amateur or professional musician, music lover or just curious, Le Violon, des hommes, des oeuvres was designed for you. 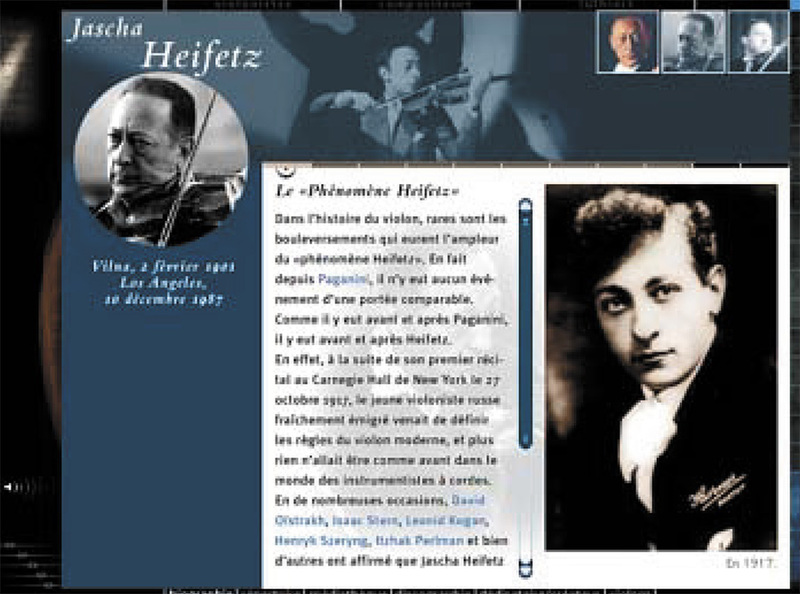 The multimedia title brought together the most important knowledge and documents on the violin and made this CD-ROM the first true encyclopedia on this instrument, with: 10,000 works written by 650 composers, 250 biographies of interpreters and 37 biographies of luthiers, 60 violins as if you had them in your hands, 27 comprehensive discographies of the greatest virtuosos, 120 books listed in a bibliography. A complete illustrated lexicon with 1,000 photographs and illustrations, 20 minutes of video, 300 excerpts of the most famous works of the repertoire, interpreted by 90 virtuosos representing 3h30 of music in Hi-fi quality. The project was owned by Accord parfait, designed and built by Magic Media and published by Editions Montparnasse and captured a lot of awards during the end of the 90’s. 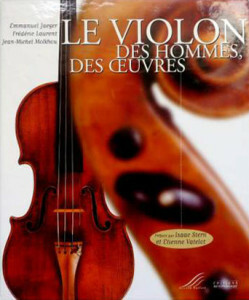 Le Violon, des hommes des oeuvres”: Flêche FNAC D’Or 98, EMMA’98 nominee, Prix Moebius Art & Culture 98, Prix Multimedi’Art Bronze 98, France. Apologies for the bad quality of the screenshots, these are the only remaining visuals of the project.